Eli has come to understand that both frequentist (Tamino) and Bayesian (James Annan) statistical descriptions have serious problems when applied to climate from scientific and policy standpoints. The mixture of the two is quadratically difficult as anybunny entangled in discussions of future changes can tell. Local responses to global trends which are worse. There is, however, another way of looking at things, loosely described as Possibility Theory. Possibility Theory grew from studies of fuzzy sets and is useful for analyzing situations where knowlege is incomplete and was first described by Lofti Zadeh. Wikipedia, of course, has a description. McLean, J. D., C. R. de Freitas, and R. M. Carter (2009), Influence of the Southern Oscillation on tropospheric temperature, J. Geophys. Res., 114, D14104, doi:10.1029/2008JD011637. With comments at Open Mind, Real Climate, James Empty Blog, In It For the Gold, Deltoid, More Grumbine Science and just about the entire Rabett Run Blogroll. An instant classic of denial and self regard. The main use of this is to know where peer review seems to be failing. But friend Cohenite already delivered and Eli blogged on it. Still, there is a fair amount of E&E in there, so here are Eli's top four. 5. "Thermal pollution causes global warming" Bo Nordell, Global and Planetary Change 38 (2003) 305–312. 4. G. V. Chilingar, L. F. Khilyuk, O. G. Sorokhtin. Cooling of Atmosphere Due to CO2 Emission, Energy Sources, Part A: Recovery, Utilization, and Environmental Effects, 30(1), 1 - 9 (2008). Actually anything by this trio. Brings incoherence to new heights. 3. Christopher Essex, Ross McKitrick, Bjorne Andresen; Does a Global Temperature Exist? Journal of Non-EquilibriumThermodynamics, 32(1) 1-27. 2. Ferenc Misckolczi; Greenhouse effect in semi-transparent planetary Atmospheres. Quarterly Journal of the Hungarian Meteorological 111(1), January–March 2007, 1–40. The Earth Observer, a NASA newsletter on the Earth Observation Program has been running Lora Koenigs diary describing winter at Summit Camp on the top of Greenland. Definitely worth reading. Hello! My name is Lora Koenig and I am a remote sensing glaciologist and a new hire in the Cryospheric Sciences Branch at the NASA Goddard Space Flight Center. My research uses satellites to monitor the ice sheets and I am always interested in how well measurements from space compare to those taken on the ground. My interest in ground truth data and learning more about ice sheets has lead me to spend this winter at Summit, Greenland (Latitude 72.5 N Longitude 38.5 W). Over the course of this weekly blog I will tell you about my life and science, in the middle of the Greenland Ice Sheet, in the middle of the winter. I will start with a quick introduction and explain how I ended up in the dark on an ice sheet. Werner Aeschbach-Hertig brings interesting news about Rabett Run's friend S. Fred Singer and the Chilingar. The issue of increased damage from extreme weather driven disasters as a result of climate change is attracts the same polemic that the gallery previously observed about climate change and global warming. Fallmuchfurtherback Position: If the local left (relatively) party didn't insist on building on the coast or in flood planes there would not be a problem. Fallwayfurtherback Position: What have the Bangladeshi's ever done for us? In many ways this resembles the progression we have seen throughout the history of climate change, and the answers given by the IPCC (and previous reports). FAR: The unequivocal detection of the enhanced greenhouse effect is not likely for a decade or more. AR4: Most of the observed increase in globally averaged temperatures since the mid-20th century is very likely (> 90% certainty) due to the observed increase in anthropogenic (human) greenhouse gas concentrations. The state of the art can be found in a new paper by Schmidt, Klemper and Hoeppe that was previously commented on at Rabett Run. Particularly interesting is the correlation between sea surface temperature and tropical cyclone damage. 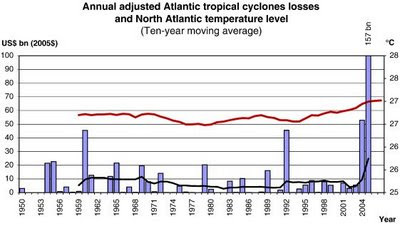 The bars in the figure to the right shows adjusted losses for tropical cyclones that made landfall in the US. The adjustments take account of socio-economic changes. The black line is a ten year smoothed average. The red line is the smoothed North Atlantic sea surface temperature. The good correlation of the losses with the sea surface temperature provide a cleft stick to hoist DenialCON 2 position holders on, leaving them the oxymoric position of asserting that sea surface temperature is independent of global warming. Eli is confident that they will be up to it tho. As Chris pointed out, the conclusion brings us pretty close to having to invoke DenialCon 4.
annual adjusted losses since the beginning of the last cold phase (1971) show a positive trend, with an average annual rise of 4% that cannot be explained by socio-economic components. This increase can at least be interpreted as a climate variability impact. There is no evidence yet of any trend in tropical cyclone losses that can be attributed directly to anthropogenic climate change. But we advance the premise that if losses are affected by natural climate fluctuations, they are also likely to be affected by additional global warming due to anthropogenic climate change. This premise is supported by indications that the intensity of tropical cyclones is affected by anthropogenic climate change." An objection to this has been raised on the basis that the trends do not extend back to the 1950s. File that one in the wishful thinking category given the physical correlation between global warming, sea surface temperature, and tropical cyclone intensity. See Harold, not once was the name of the The Talented mentioned or even linked to. About two years ago Stan Sanders group at JPL tossed a bombshell into our understanding of stratospheric ozone depletion, with a new, and much lower measurement of the chlorine peroxide (ClOOCl) absorption cross-section. This was a bombshell because it meant that there would be a lot less free chlorine in the stratosphere available for ozone depletion. Drew Shindell blogged on it at Real Climate, there was a bit of triumphalism on the denial beat. so the rate of photolysis, which is proportional to the absorption cross-section, determines how much ClO is available for the cycle. Because O3 absorbs most of the light at shorter wavelengths than 305 nm, for all practical purposes, only the absorption cross-section of ClOOCl above ~305 nm is important. The rub, of course, is that to measure the absorption cross-section of a molecule, the lab bunnies need to know how much of the molecule is in the light path. This is not easy. As a matter of fact it is very tough, especially for ClOOCl because you cannot prepare a pure sample, there will always be Cl2, O2, and maybe other stuff hanging around. Before Pope, Hansen, Bayes, Friedl and Sander, others had tried to figure out the amount of ClOOCl in the light path by mass balance, starting from the initial reactant concentrations and using absorption spectroscopy in various regions of the spectrum to assign concentrations of the stable species where known. Sanders group did a spectral subtraction of the know Cl2 spectrum from the observed spectrum in the UV, which they assumed was a combination of ClOOCl and Cl2 (O2 does not absorb much until 200 nm). The Academica Sinica group (H. Y. Chen, C. Y. Lien, W. Y. Lin, Y. T. Lee and J. J. Lin) chose a different path. They created a molecular beam containing the equilibrium mixture of ClOOCl and Cl2 and used a laser to photodisocciate (shoot out) each. Because they knew the absorption coefficient of Cl2 at the laser wavelengths, they could get the ratio of the ClOOCl to Cl2 cross-sections at each wavelength. The results are shown in the figure and agree well with earlier measurements. As they point out all three methods have their difficulties. They think that Pope, et al, overcorrected for Cl2, but that really is speculation. This is the way that science auditing works. Comments?